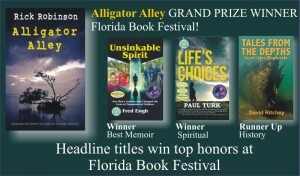 ORLANDO –A novel set in the Everglades and examining a man’s struggle with his destiny has won top honors at the 2016 Florida Book Festival. Rick Robinson’s “Alligator Alley” (Headline Books) is the story of James Conrad, who is spending his 50th birthday alone in South Florida. When he decides to head into the Everglades to conjure some memories of his uncle, he confronts the notion that the small town definition of success may all be a ruse, and asks the reader to ponder whether they would, indeed, change course in life if they could. Top Honors also went to Fred Engh – Unsinkable Spirit, Winner for Best Memoir; Paul Turk – Life’s Choices, Winner for Best Spiritual Novel; and David Ritchey – Tales From the Depths, Best History Book. Robinson and other winners, runner-ups and honorable mentions in the competition will be honored at a private awards ceremony in January.